This Demonstration shows a numerical simulation of the cyclic-voltammetric response for a one-step electro-adsorption reaction ( ) involving the soluble species , with constant concentration in the electrolyte, together with the adsorbate and free sites at the electrode surface. The thermodynamics is described by the Frumkin isotherm. Cyclic voltammogram and surface coverage versus potential curve are plotted. 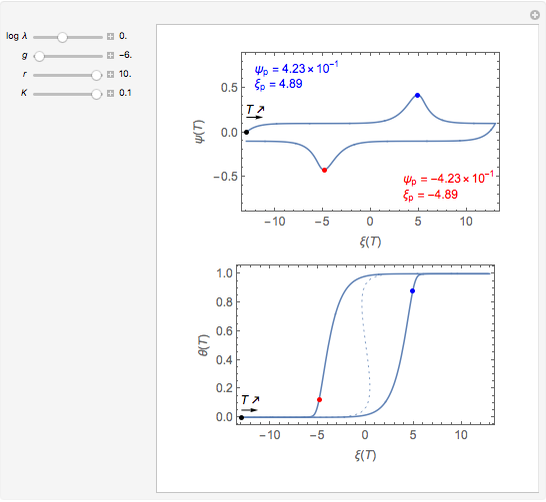 You can experiment with the effects of electro-adsorption kinetics, the interaction parameter in the adsorbed phase, the electrolyte resistance, and the double-layer capacitive effects using the controls for the relevant dimensionless parameters. This Demonstration models the faradaic response for a one-step electro-adsorption reaction ( ) to a typical cyclic-voltammetry (CV) input signal. The reaction involves the soluble species , with constant concentration in the electrolyte, together with the adsorbate and free sites at the electrode surface. The thermodynamics of the electrochemical system is described by the Frumkin isotherm, with positive/negative values of the parameter corresponding to repulsive/attractive interactions, respectively, in the adsorbed phase. The value reduces to the Langmuir isotherm. Dimensionless notation is used for the sake of generality. The relevant notation is , , , , , and , where is the equilibrium potential corresponding to and the constant concentration , denotes the reaction rate constant ( in , with ) under the same conditions, , where all symbols have their usual meaning, is the potential scan rate in V/s, is the time variable in s, is the faradaic current density in , is the controlled potential (with linear variation with respect to time) given in V versus reference electrode, is the surface concentration of free sites in , is the electrolyte resistance in , and is the double-layer interfacial capacitance in . 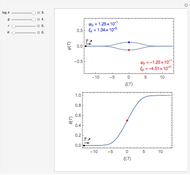 The dimensionless input signal	is with , where and are the dimensionless initial and reversal potentials, respectively. 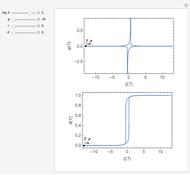 The initial and reversal potentials are equal to and 13, respectively, for the present numerical simulation. 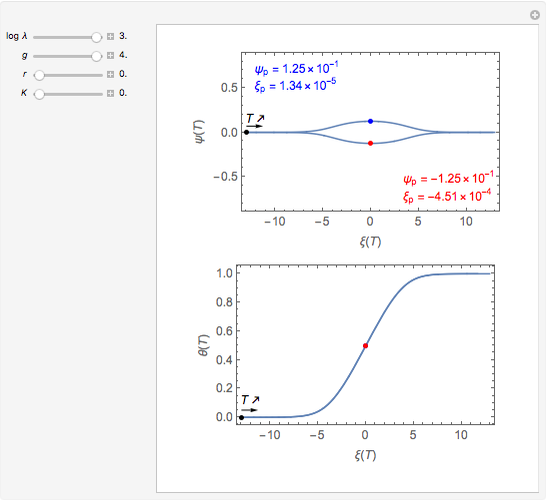 The numerical solution of kinetic equations, together with the initial conditions, is readily obtained using Mathematica&CloseCurlyQuote;s built-in function NDSolve. The dimensionless current density is computed as a function of time as the sum of its faradaic and capacitive contributions. 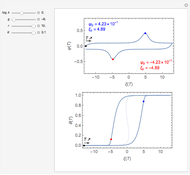 You can vary the kinetic parameter (logarithmic scale), the interaction parameter , the dimensionless ohmic resistance , and the dimensionless interfacial capacitance . 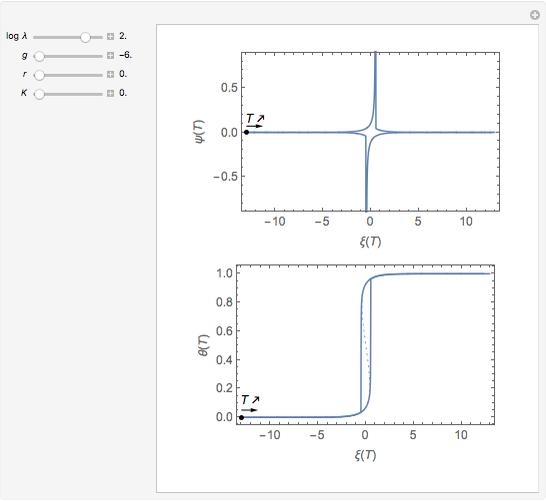 Numerical simulation provides the dimensionless cyclic voltammogram (the parametric curve, versus ), together with the surface coverage ratio by the adsorbate, plotted as solid lines, versus , while the dashed line refers to the electro-adsorption isotherm. The dimensionless coordinates of CV peaks are evaluated in both oxidation (forward scan) and reduction (reverse scan) directions, except in the special cases of very large current spikes. The two limiting behaviors pertain, respectively, to reversible electro-adsorption kinetics ( and for ) and to totally irreversible kinetics. In the latter case, and , with . From the symmetry factor in the oxidation direction, with the forward potential scan under Langmuir isotherm conditions ( ), in the absence of ohmic and capacitive effects ( and ), the results can be readily obtained by numerical experimentation. E. Gileadi, Physical Electrochemistry: Fundamentals, Techniques and Applications, Weinheim, Germany: Wiley-VCH, 2011 p. 151. J.-P. Diard, B. Le Gorrec, and C. Montella, Cinétique électrochimique, Paris: Hermann, 1997 p. 335. Belén Molina Concha, Claude Montella, and Jean-Paul Diard "Cyclic Voltammetry for an Electro-Adsorption Reaction (EAR)"